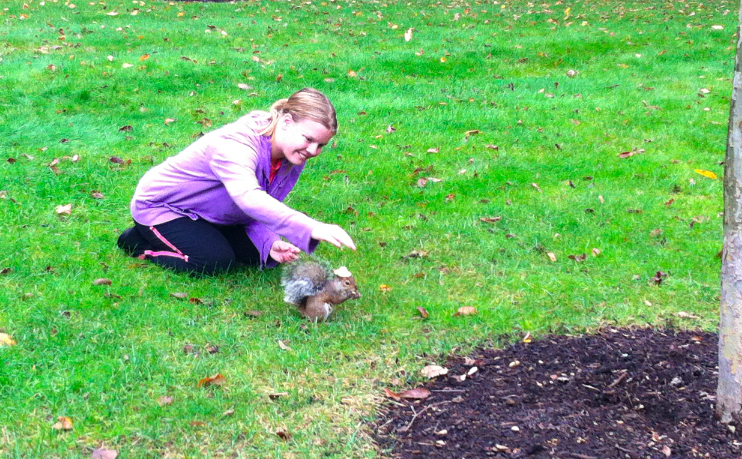 Penn State student Mary Krupa has become the milliner of the school's local squirrel population. Her model of choice is Sneezy, who just so happens to look fantastic in hats. Mary Krupa is a freshman at Penn State who loves squirrels. She feeds peanuts to the squirrels on campus, and they've come to know her well enough that they allow her to place tiny hats on them. Her favorite one is named Sneezy, and she has a Facebook page all about him and his delightful hats. How did Mary decide to start putting hats on ground rodents? She tells BuzzFeed, "I honestly don't know what inspired me to put hats on the squirrels - it started with just feeding them. Then I realized, 'hey, he's not running away when I get close - I wonder if I can pet him?' (Yes, I know that trying to pet wild animals is stupid. I don't know what I was thinking). Anyway, one thing led to another, I remembered that I had a tiny doll's hat lying around my house, and decided to put it on the squirrel for kicks and giggles." So this is what college kids get up to when they're not hitting the beer bong, I guess. "Four squirrels and seven years ago..."
Yinz rootin' for the Stillers?